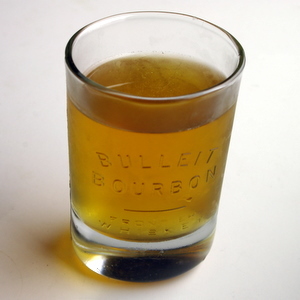 Bulleit Bourbon is a modern take on an old recipe. The modern product started in 1987, when Tom Bulleit attempted to recreate his great-great-grandfather’s bourbon recipe. By all accounts, the result is a great tasting bourbon. It’s long been a favorite of mine. When I received a box with a full bottle and two logo glasses, I felt compelled to post to Twitter a thank you for the care package. Bulleit is one of the more rye-like Bourbons out there, having approximately 30% rye in its mash bill. It’s still smooth enough to be a bourbon, but the rye gives it a peppery forward quality that makes it a great mixing whiskey. At 90 proof (45% ABV), it also packs a little extra punch. On the nose, Bulleit lets you know that it is aged in oak barrels. On the tongue, the rye asserts itself in a playful way, along with some notes of apples and vanilla. I definitely enjoy Bulleit on the rocks, but I really like to use it for making great drinks. It should not be surprising that it tastes great in those cocktails where either rye or bourbon is called for, such as a Manhattan or Old Fashioned. I’ve been trying to expand my horizons lately by going through my steadily increasing cocktail book collection to find new drinks. Tonight I was paging through Harry Johnson’s New and Improved Bartenders’ Manual, a late 1800’s guide recently reprinted by Mud Puddle Books. Looking at the whiskey drinks, I found his take on the whiskey daisy, and gave it a try. Below is my adjusted version of his drink. Mix all ingredients over ice, and strain into cocktail glass. Garnish with fruit if it strikes your fancy. I removed the sugar he called for as the yellow Chartreuse was plenty sweet enough, and upped the citrus for the same reason. The resulting cocktail has an unexpected mint aftertaste, which I’ve never noted in Chartreuse before, but will see if I find elsewhere. A fun twist on bourbon, and one I’ll try again, although it won’t replace the Manhattan as my favorite whiskey drink. At $27 a bottle with taxes in Washington State, I think Bulleit Bourbon is a great deal. I find it a great go-to choice, and recommend it often as an affordable quality bourbon. While I can’t always justify the price of Woodford or Ridgemont Reserve for mixing, it doesn’t take me much to feel like a bottle of Bulleit is worth the cost. Thanks for the recipe! I like this bourbon a lot, I’ll have to try the cocktail. Sub the soda water with Ginger Beer! It’s spicy and DEElicious! First had it when I was down in Florida, delicious. If you add a little simple raw cane syrup and a spritz of lemon, delicious. Is it available at most liquor stores in Washington state?